Environmentalists in Siberia are expressing concern over an ongoing fire at the world’s largest sawdust dump—a fire that’s been burning since 2013 and will continue to do so for years to come. 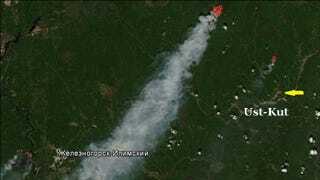 As The Siberian Times reports, the monumental mountain of sawdust—which caught fire three years ago—is located in the Ust-Kutsky district of Irkutsk, and measures more than 10.4 hectares (25.7 acres) in size. That’s roughly the size of 800 Olympic swimming pools. Adding insult to injury, 15 trucks arrive each day from the Trans-Siberian Forest company carrying 70 cubic meters (2,500 cubic feet) of sawdust waste. They’re literally adding fuel to this fire. Estimates place the total amount of sawdust at the site at about two million cubic meters (70 million cubic feet). To prevent the spread of smoldering flames, the company has constructed a “mineral border line” around the dump (guessing that means a bunch of rocks), and a fire crew is on permanent standby.